World Education Fair May 2016- A golden opportunity for students who wish to obtain an international qualification in the university of their choice. 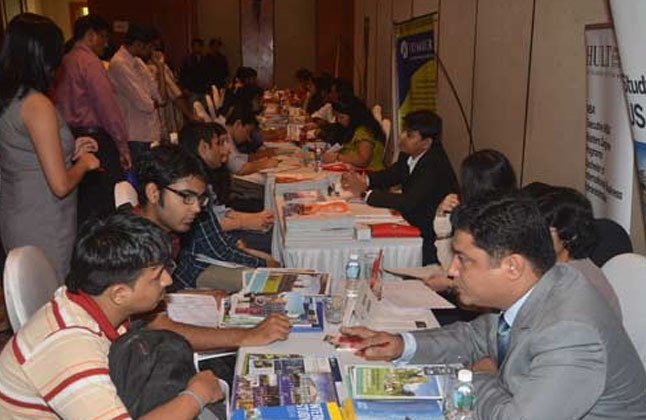 At The World Education Fair, students get opportunity to meet Delegates from internationally renowned universities. The event offers attendees unique opportunities to interact one on one with delegates from top academic institutions. All queries on visas, loans, financial assistance and a comparative analysis of educational global systems would be addressed by experts in the field of overseas academic process management. With a chance to obtain on the spot offers, admissions, scholarships and application fee waivers for complete applications, the World Education Fair is a brilliant option for any student considering an education abroad. 1. Apply to renowned universities from around the globe. 2. Guidance on the universities admission process. 3. Learn about scholarships and application fee waiver opportunities. 4. Process your application for the upcoming intakes. 5. Obtain on the spot offers from universities. 6. Obtain guidance on visa process and availability of educational loans. 7. Get guidance on IELTS/TOEFL/PTE/GMAT/GRE/SAT Coaching. 8. FREE assistance from admission to visa to all students who apply in the fair. Many scholarships are available that can reduce the cost of your program. Students are often overwhelmed by the costs of tuition fees but equally unaware of the various of scholarships available to good students to study abroad. Over 300 students received part/ full scholarships through Edwise for courses commencing in 2014. Scholarships ranging from 5% - 100% of the total tuition fees amounting to over Rs. 5 crore have been awarded to deserving Edwise students. "World Education Fair - Must Visit for those who are planning to study abroad. They provide step by step guidance on each and everything right from selecting the course till you get the visa. Thank you Edwise for hosting such an event without which it would have been impossible to study abroad"
"The World Education Fair is the event for students who are interested for abroad studies. I got good exposure over there as many universities participate and you get to weigh your interests directly with the university delegates." "i had no knowledge about studying abroad. This fair was very informative & helped me clear all my doubts. You need to think on the broadest level possible because we have entered a new world... in which a global system of higher education is emerging. Must Visit for those who want to study abroad because the path you choose today will decide your future."